We host many middle school groups, and yours are always at the top for engagement, politeness, and overall desire to learn about college. You are clearly doing something right. Our after school and summer learning activities help middle school students develop the skills and personal drive they need for a 21st Century knowledge-based global economy. Through digital learning, our youth create, collaborate, problem solve, communicate, and connect with the world. We believe it’s critically important to reach students in their middle school years, well before they enter high school. Important components of our programs include academic enrichment, digital technology exploration and high school, college and career connections. 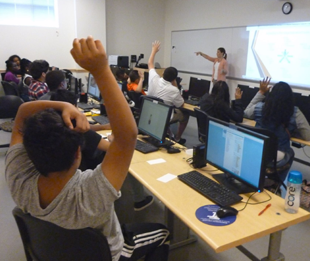 Currently P4L serves 150-170 students, annually, at 8 MCPS middle schools, providing Information, Communication and Technology (ICT) focused, project-based learning. Dig.Lit focuses on communication technology, with an emphasis on digital media including videography, web development and digital design. Code-Tech Squad focuses on the foundations of physical computing including circuitry, electronics, coding and building micro controllers (arduinos) and mini-computers (raspberry pi). GRRL Tech (Girls Really, Really Love Technology), for girls only, includes a wide array of girl-oriented ICT projects in coding, video game design, web development, digital graphics and videography.